I now make frittatas on a regular basis. I have started cutting my basic recipe in half and making it in a smaller pan so it is an ideal weekend breakfast. Actually, I have cut it down to 3 eggs, which is a little less than half, but that makes it the equivalent of the three-egg omelet I would have if I went out for breakfast so I can eat it in one or two sittings without too much guilt. In addition, I have learned a trick or two since my last post, and thought I would share them with you. A few weeks ago my friend gifted me with an abundance of CSA veggies she was not going to be able to use before leaving town. It was an inspiring assortment of goodies - turnips, lettuce, Swiss chard, and a different green I had never before seen. I did a little online searching, but nothing I found quite matched what I had. It was more leafy than the greens with which I am familiar, with red, almost rhubarb-looking stems. I knew it could not be rhubarb, however, because rhubarb leaves are actually toxic and should not be eaten. Ha! That's an unplanned tip I just gave you, free of charge. This is what my mystery greens looked like. I was stumped, so I threw one of the leafy stems into my lunch bag the next morning and took it in to work with me. I figured if anyone would know what it was it would be my boss, an expert gardener and an inspiration to me with her knowledge of all things flora and fauna. And sure enough, I handed it to her and she said, "That's Russian red kale." Reassured, I decided it would make a lovely frittata. I was forced (poor me) to buy some double cream cheese when I couldn't find organic cream cheese at the two stores I had access to when I needed it, then after I got the cream cheese I no longer needed the double cream, which freed it up for use here. You can see how lovely it looks in the picture up there, and I can tell you that it tasted delicious. A Russian Red Kale and Double Cream Cheese frittata is a very good thing, to quote some other person out there who cooks a little. And here is another very good thing for a frittata. Instead of putting the cheese on top at the very end, mix about one fourth of a cup of grated parmesan cheese in with the egg and vegetables. It sets up beautifully and tastes delicious. Now for the main tip. This is something I had heard from different sources, but didn't think it would really make that much of a difference, so I ignored it. Then I was watching the show "Extra Virgin" on the Cooking Channel. I love this show. I have always like Debi Mazar and now I think I have a little girl-crush on her. Her husband Gabriele Corcos isn't so bad either. Now that I think of it, I guess it would be more accurate to say I have a couple-crush on the both of them. They are just too cute together . . .
Ok, I'm back. On one episode they made a frittata, and Gabriele was quite insistent that you should mix the vegetables into the egg mixture and then pour the whole thing back into the pan, rather than adding the egg mixture while the vegetables were already in the pan. And since Gabriele was telling me I had to do it that way, I realized I had to do it that way. And guess what? He was right. 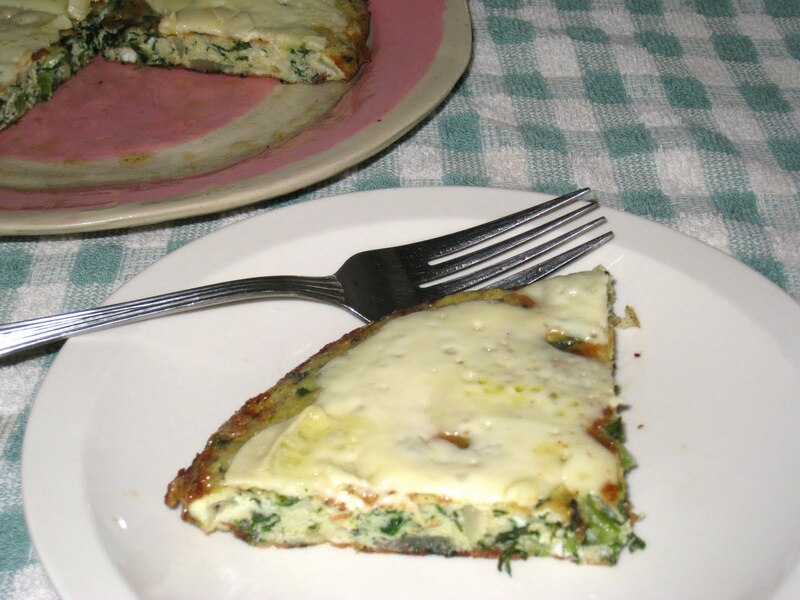 With this method, the vegetables get spread evenly throughout the frittata, rather than staying on the bottom. But you have to be a little careful or you will cook the eggs when you add the hot vegetables. You have to temper them. Here's how. Saute the onions, garlic, and whatever other vegetables you will be using in one or two tablespoons of olive oil. While the vegetables are still cooking in the pan, crack the eggs into a bowl large enough to hold everything and add whatever seasoning you are going to be adding (I like to add about one-half of a teaspoon of crushed dried tarragon in addition to the salt and pepper). Whisk together until well blended and the eggs are frothy. Take the skillet with the vegetables off of the heat. Add a scant spoonful of the vegetables to the egg mixture and whisk it in immediately. This will bring down the temperature of the eggs so they match the vegetables, and this keeps them from cooking. You can add another, bigger, spoonful of vegetables and stir them in, and then you can add the rest of the vegetables without worries. When the skillet is empty, return it to the burner. Add about a tablespoon of butter and let it melt. Slowly pour in the egg mixture so it spreads the butter out ahead of it. Turn the heat as low as it will go and cook until the egg is mostly set, then finish the frittata the usual way.